LONDON – Team USA had its biggest track & field night thus far at 2012 Olympic Games, bringing home three silver medals and one bronze – including some from unexpected sources – at Olympic Stadium. Leo Manzano (Austin, Texas) grabbed a dramatic silver in the men’s 1,500, Dawn Harper (Los Angeles, Calif.) and Kellie Wells (Orlando, Fla.) went 2-3 in the 100m hurdles, and Erik Kynard (Manhattan, Kan.) was second in the men’s high jump. One of the sport’s most highly anticipated finals, the 100m hurdles played out in spectacular fashion, pitting the defending gold medalist, Harper, against the heavily favored world champion, Sally Pearson of Australia. At the gun, Wells got out well, matching Pearson of Australia. Harper and Lolo Jones (Baton Rouge, La.) followed. Harper soon found her form and looked strong as Pearson edged into the lead. Harper was closing on the Aussie over the final hurdle, but Pearson made it to the finish line first in an Olympic-record time of 12.35. Harper ran nearly two-tenths of a second faster than her 2008 Olympic gold medal performance to win silver in a personal best of 12.37. Harper’s time is the best mark ever for any second place finisher in the 100m hurdles and ties her with Joanna Hayes as the second-fastest American in history, behind Gail Devers. Keeping her composure and finishing strong, Kellie Wells (Orlando, Fla.) rounded out the podium in a personal-best time of 12.48m. Jones ran a season best as she took fourth in 12.58. Earlier in the evening, Harper had set a personal best in handily winning her heat in 12.46. Jones was the fastest qualifier on time, placing third in heat 2 in 12.71, and Wells won heat 3 in a then-season best of 12.51. Thanks to a brilliant stretch run in the men’s 1,500m, American men have won two medals at 1,500m or over for the first time at an Olympic Games since 1968 – coincidentally, the last time the U.S. won this event at the Games. 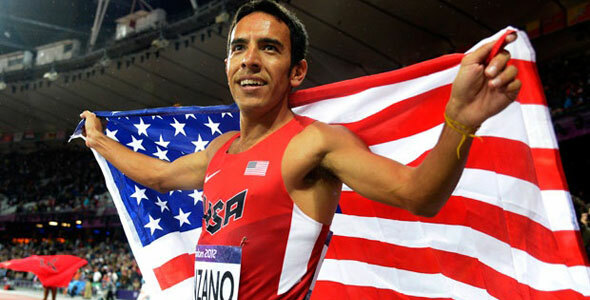 Manzano took home the first U.S. medal in the 1,500 since Jim Ryun in that year. Tuesday night’s race came down to a furious sprint for the finish line, and Leo Manzano (Austin, Texas) was able to capitalize on his renowned closing speed to sixth to second in the last 150m of the race. Manzano crossed the line in a season-best time of 3:34.79, the fastest time ever by an American at the Games, finishing behind gold medalist Taoufik Makhloufi of Algeria (3:34.08). 2011 World Outdoor bronze medalist Matthew Centrowitz (Eugene, Ore.) also had a strong stretch run. After running at the front for most of the race, Centrowitz had fallen back heading into the final stretch. He closed hard and finished fourth in 3:35.17, only two-hundredths of a second behind Abdalaati Igulder of Morocco, on whom he was closing. Centrowitz’s fourth place finish gives the U.S. the best 1500m result since 1936 when Glenn Cunningham and Archie San Romani finished 2-4. Sporting American flag knee socks, 21-year old Kynard (Manhattan, Kan.) entered the high jump final tied with the seventh-best personal best in the field. His skill, with perhaps a motivational assist from the socks, propelled him to an unexpected silver medal with a best clearance of 2.33m/7-7.75, behind gold medalist Ivan Ukov of Russia (2.38m/7-7.75). Kynard had only one miss in the competition while clearing four heights. Mutaz Essa Barshim of Qatar, Derek Drouin of Canada and Robert Grabarz of Great Britain ended in a three-way tie for third at 2.29m/7-6. Jamie Nieto (Chula Vista, Calif.) placed sixth, also with a clearance of 2.29m/7-6, and 2011 World Champion Jesse Williams (Eugene, Ore.) tied for ninth at 2.25m/7-4.25. 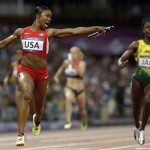 It was smooth sailing for American 200 meter runners in the women’s semifinals. Two-time silver medalist Allyson Felix (Santa Clarita, Calif.) looked effortless in easily winning heat 2 in 22.31, 400m gold medalist Sanya Richards-Ross won heat 3 in 22.30, and 100m silver medalist Carmelita Jeter (Gardena, Calif.) was second in heat 1 in 22.39, behind defending gold medalist Veronica Campbell-Brown (22.32). The final will be contested Wednesday evening. For the first time since 1992, the U.S. will have two men running the final of the 800m. Nick Symmonds (Springfield, Ore.) and Duane Solomon (Los Angeles, Calif.) squeaked through to the final as the duo took both the qualifying spots on time. The U.S. has not had anyone in the final of this event since Solomon’s coach, Johnny Gray, ran in the final in 1996. Symmonds took third in heat 2 in 1:44.87 and Solomon took third in heat 3 in 1:44.93. In women’s long jump qualifying, Janay DeLoach (Fort Collins, Colo.) made it to the final on her first jump with a mark of 6.81m/22-4.25. World champion Brittney Reese (Gulfport, Miss.) let it come down to the last jump after fouling on her first two attempts. Reese jumped 6.57m/21-6.75 to earn her way into the final. Chelsea Hayes (Ruston, La.) 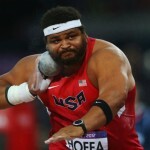 had a best mark of 6.37m/20-10.75 and did not advance.